I’ll be the first to admit it, I’m not a breakfast person. I know, that’s crazy. But I married into a breakfast family, and not just plain jane morning meal enthusiasts; we’re talking dedicated waffle fans. The waffle maker sitting in my cupboard is probably the only appliance my husband knows how to use, and finding that machine was a test of patience for yours truly. But shopping for the appliance may be a bit easier for you, thanks to our colleagues down the hall at Consumer Reports who so bravely took up the challenge to find the best waffle maker in the land. CR tested half a dozen of the most popular waffle makers on the market; from all-in-one makers to those that cook on the stove. The appliances were tested on high and low settings, and scored based on the consistency of browning from side to side, and batch to batch. Looking for more breakfast tips? Check out three maple syrup facts everyone should know. The final verdict: sometimes you have to spend a little more dough for a perfect breakfast item. CR found the $100 Cuisinart Breakfast Central consistently turned out evenly cooked waffles, and beeps when it’s done cooking. Additionally, it has removable griddles for easy cleaning. 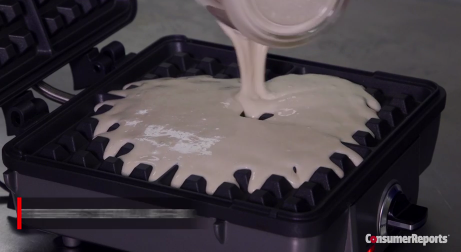 Of course, no waffle is complete without a little sweet syrup on top. To that end, CR tested 14 different maple syrups. Testers found that all were pretty good and suggest customers buy based on price. Top contenders for vale included Costco’s Kirkland’s Signature Organic Maple and Trader Joe’s 100% Vermont Maple Syrup.